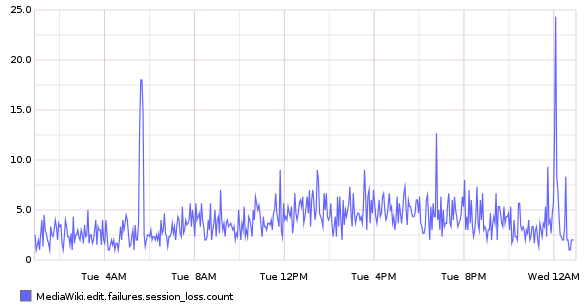 The number of connection timeouts to the session redis servers (which are on the mc* boxes) is worryingly high, lately. This might be related to T102199. rEABFe4e78dcc4dce: Revert "Conversion to using getMainStashInstance()"
hoo raised the priority of this task from to Needs Triage. hoo added a project: acl*sre-team. hoo added subscribers: hoo, ori. ori added a subscriber: aaron. that seems to coincide with 1.25wmf16 1.25wmf15 ? I am going to depool db1035, it happens around the same time and it is giving me connections errors too. Jobs (redis) on that host are failing me. "normalized_message": "Error connecting to 10.64.16.24: Can't connect to MySQL server on '10.64.16.24' (4)"
$ grep 'Failed connecting to redis server' hhvm.log | grep -c "Jul 27 07"
$ grep 'Failed connecting to redis server' hhvm.log | grep -c "Jul 27 08"
$ grep 'Failed connecting to redis server' hhvm.log | grep -c "Jul 27 09"
$ grep 'Failed connecting to redis server' hhvm.log | grep -c "Jul 27 10"
$ grep 'Failed connecting to redis server' hhvm.log | grep -c "Jul 27 11"
$ grep 'Failed connecting to redis server' hhvm.log | grep -c "Jul 27 12"
Revert "Conversion to using getMainStashInstance()"
ori mentioned this in rMWb12fe91abee6: Updated mediawiki/core Project: mediawiki/extensions/AbuseFilter…. Looks like the hhvm.log errors at "Connection timed out" (from https://github.com/facebook/hhvm/blob/master/hphp/system/php/redis/Redis.php). That's from the PHP C fsockopen() wrapper. I don't see the "too many clients" error, and the graphs show very low conns/server, so even 1k ulimit can't be the issue there. I have a vague idea that https://phabricator.wikimedia.org/rEABF9ffa4003226c46813dfd6616ce173252b1f258c2 was surfacing a problem that already existed more often. It's probably best to leave it reverted for the moment, especially to get an idea if the rate of failure decreases linearly with the decrease in requests. I have a feeling it won't (in a good way), but that's just a guess. I was able to correlate a couple instances of these failures on flourine with a redis server I was strace'ing. I have put the logs for that on mc1004:/tmp# /home/rush/redisfailures.txt I don't see a smoking gun there. 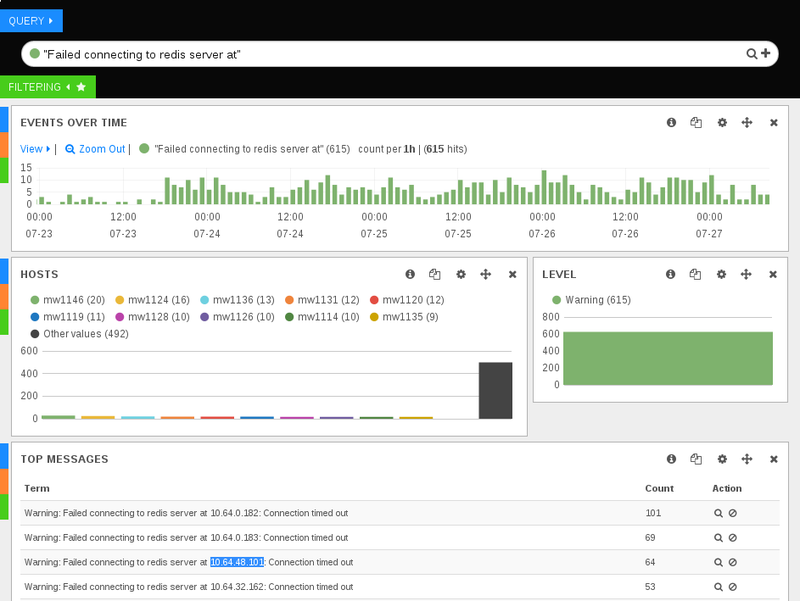 Using a really simple redis client on mw1145 and a few mw* hosts I was able to generate some failures per 100K requests. Generally 5-8 failures to connect on a timeout of 1s, which go away as I increase the timeout to 2 or 3 seconds in general. 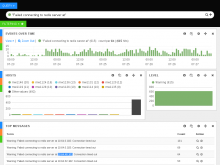 What is the timeout in production for our redis client? Still a bit sick and I'm out of ideas for the moment. Maybe this digging will lead someone else to something. Also I was only able to mock the failure to connect errors from mw* hosts, I tried from the mc* host to itself (even teh same ip) and it never happened. we could run a redis server with a higher verbosity logging format. 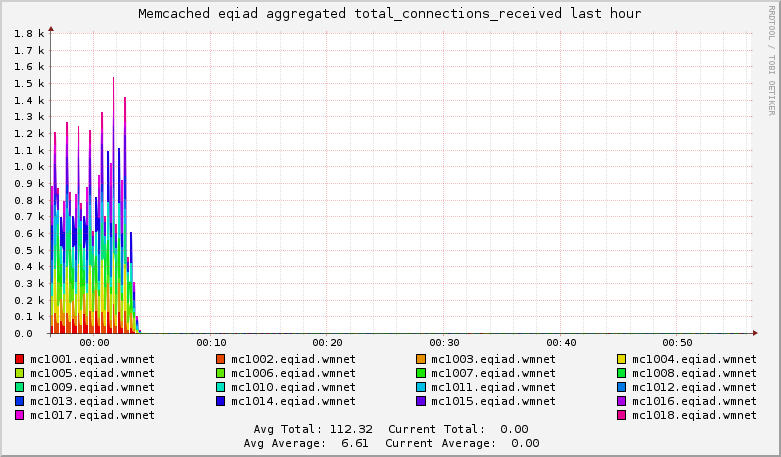 Is that graph supposed to be instantaneous_ops_per_sec? I would expect a total_commands_processed graph to just be non-decreasing except on restarts. Good point. I believe this is being collected based on config at modules/redis/templates/redis.pyconf.erb and from what I can see it is collecting the correct param but it must be providing a delta at collection time. So I think this is somewhat of a hybrid between osp_per_second and total_commands_proc. I'm at a stopping point here where I think we need to (re)consider a few courses of action. 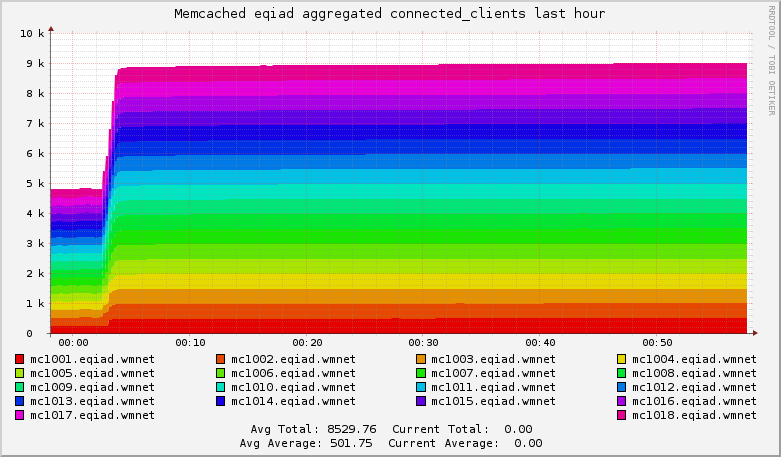 It seems our memcache timeout in prod is 250ms and our redis timeout is not set and the default is 1s. mc also uses nutcracker which does some of the heavy lifting re: connection pooling. 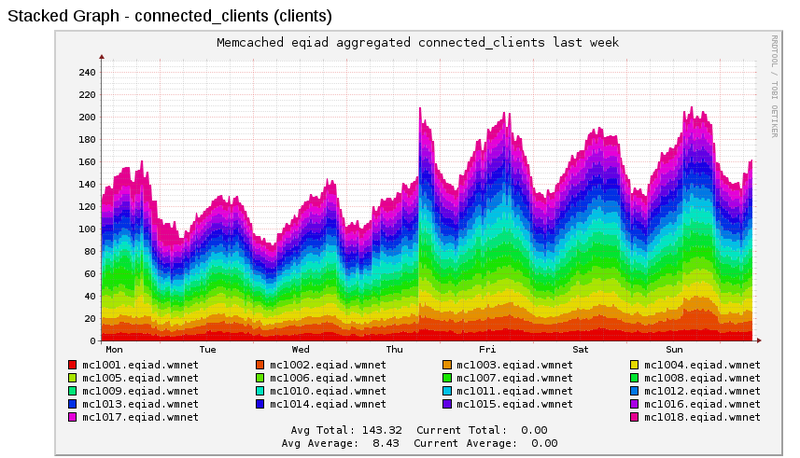 There are a number of things recently that have been transitioned from mc to redis. The order of magnitude jump in redis connection errors happened on the 23rd when https://phabricator.wikimedia.org/diffusion/MW/browse/wmf%252F1.26wmf15/ hit the wikipedias but https://gerrit.wikimedia.org/r/#/c/221885/5 isn't far behind. If I break down the errors by mc* host https://phabricator.wikimedia.org/P1076#4926 it does seem interesting that 5 of the top 7 offenders are in rack A5. That switch seems to be somewhat suspect in terms of buffering and connection rate handling, but I don't think it's purely indicative of isolation of failure since it is so spread around otherwise. I think the general theme here is the aggregate change in usage pattern for redis has resulted in a large increase in failures. This is probably due to a combination of factors at the heart but primarily connection pool handling and buffering that a large timeout smooths over. It seems like redis in general needs more tuning and testing at scale for the use cases coming down the line. Hopefully I'm wrong and there is some easier and obvious solution. Yes, let's give it a shot. We have wanted to try it anyway. I made the requisite changes to the production nutcracker configuration already. I configured MediaWiki to use Nutcracker for connections to the sessions redis cluster a little over an hour ago. We have not had an error since, and the rate of edit failures due to loss of session data is down relative to its value pre-switchover. The redis metrics in ganglia show a higher number of overall active connections, but the rate at which new connections are coming in has dropped to zero. This is expected; it means Nutcracker's connections are indeed persistent.